Good hygiene is mandatory for your dog if you want to keep him or her in good health. So, apart from regular baths and grooming products, your dogs also needs its nails clipped to prevent hurting you or damaging the goods inside your house. 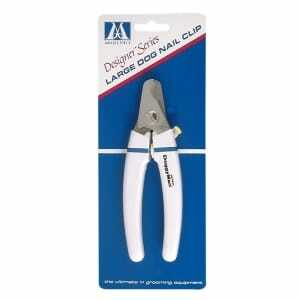 Moreover, nail clippers are good for preventing nails to grow and hide dirt or bacteria underneath. And, after going through plenty of product reviews ourselves, we have reached the conclusion that one of the best nail clippers is the Andis Premium because it comes in a large size suitable for medium and tall dog breeds, its blades are made of stainless steel and come with an ergonomic handle. If the Andis Premium clipper is not available for immediate purchase, we may also suggest taking a look at the new Millers Forge Quality as a great alternative. The heavy-duty and sharp stainless-steel blades of this model will ensure that no matter how tough the nails of your dog are, they will not be a match for this nifty product. The ergonomic handle makes it easy to use by everyone. Owners of small dogs have reported that this unit is better suited for large breeds since it is too hefty to use on smaller dogs. If you are looking for an affordable model that can offer great quality and performance, this is a variant that offers all the features that an animal lover requires to groom his or her pet the right way. No hassle or wasted time. This nail clipper is the go-to choice for many veterinarians and groomers, and that has to do with the outstanding performance it offers. The sharp stainless steel cutting blades will cut nails in no time and will remain sharp for years. A few customers had a problem with larger breeds. The unit did not manage to cut the nails cleanly, leaving them looking a bit shredded. 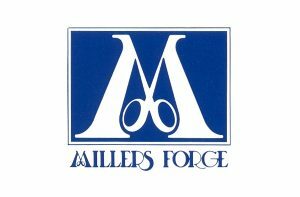 The Millers Forge Quality is built to offer pet owners a heavy-duty alternative that is capable of handling intensive use. The quality German stainless steel blades will stay sharp for as long as you use them. Say goodbye to poorly cut nails with this nifty option. The nails of your dog will be clean and precise with little pressure required. The nail safety guard will ensure a quick and painless trimming experience for both you and your pet. When used on puppies, owners had a problem seeing where to cut since the puppy’s nails are too small. This can be a problem for small breeds too. If you are in the market for a premium alternative, you can’t go wrong with the Quick Sensor. The mix of great materials and ergonomic construction will make using this option feel like a breeze. Finding the right nail clipper for your is not always easy, especially since there are so many good products available on the market. However, out of the multitude of items, we selected the top 15 we consider are relevant to you and your dog’s needs. The item comes in many styles to meet the needs of all dog breeds and sizes. The large nail clipper features heavy-duty, stainless-steel blades that will work wonders on your dog’s claws. The safety stop will prevent over-cutting or cause damage to your dog, even if it doesn’t stand still throughout the process. What we liked about the product is its ergonomic handle that can be used both by dog owners in the comfort of their own home or by salon groomers. Moreover, the spring-loaded action reduces hand fatigue and can help you cut all nails in just a matter of seconds, diminishing this traumatizing experience to the minimum for your dog. Keep in mind that this large nail clipper is mainly intended for big and super-big dog breeds, over 40-50 pounds. Most of the customers who purchased the item were pleased with the product’s quality, claiming the blades are sharp and will cut all types of claws and nails. The item comes in a large size, suitable for big dog breeds of over 30-40 pounds. For smaller dog breeds we suggest using other products or smaller sizes from the same Millers Forge company. The blades on this clipper are made of sharp stainless steel for high precision. The steel is heavy-duty and of superior quality, being made in Italy. Thus, the clipper won’t require constant sharpening and will help you finish the job in just a matter of seconds, provided your dog stands still. The company claims this is the product choice of veterinarians and pet groomers, as the handle features an ergonomic shape that will help reduce fatigue during prolonged use. 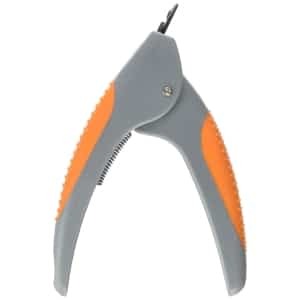 In other words, you can count on this qualitative nail clipper to cut the nails of your pet from a single strike, reducing the time count for this unpleasant process. The item’s handle comes in a great orange color and the overall measurement of it is about 8.9 inches. 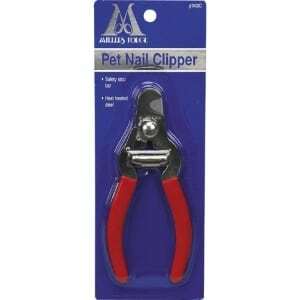 The company provides a wide array of nail clippers for dogs and cats of all sizes and breeds. This particular product is specifically designed for the nails of medium and large-sized dog breeds, regardless of their age. The item is surprisingly easy to use and will help you provide a clean and precise pedicure cut for your dog. The straight cut will put little pressure on your dog’s nails, making the entire process more bearable. This nail clipper also comes with a safety guard that will prevent over-cutting and will diminish the fear of your dog from getting near sharp objects. This product is the number one choice of thousands of dog owners across the globe, as the item was rated 4.9 out of 5 stars. Most of the customers praised the clipper’s sturdiness and blade sharpness. The lightweight design was also appreciated by dog groomers who have to provide dog pedicures all day long. Moreover, the super-long handles will fit perfectly in both small and large hands. We liked this item’s funky and friendly design, as well as the quality of the blades. This is a full proof nail clipper that comes with a built-in safety guard to prevent over-cutting or to avoid hurting your dog during the cutting process. The ergonomic handle stays strong and secure in your hand and will help you finish the pedicure in less than five minutes. What we liked about this product is that it comes with a detailed set of instructions on how to properly use the clipper and the perfect ways to ensure a clean and rapid pedicure for your pooch. This way you will perfect the art of nail clipping, and your dog will feel less anxious whenever the process will have to repeat. Also, the product’s size is perfect for small and large dog breeds alike, and even for some large cat breeds. The included nail files in the handle are convenient to use to smooth the rough edges of the nails. 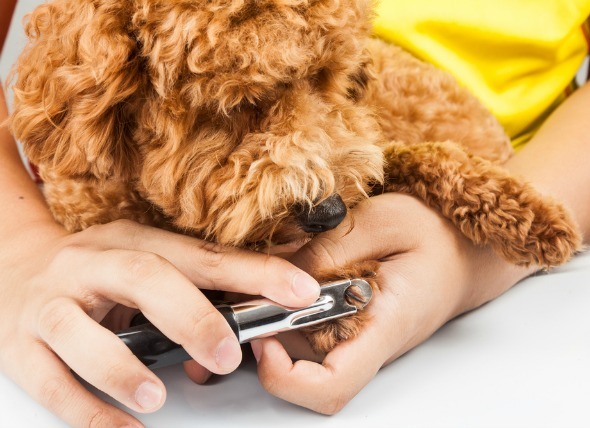 We know giving your dog a pedicure is not your favorite chore in the world, but thanks to this nail clipper, you can turn the entire experience into a pleasant one for you and for your dog alike. 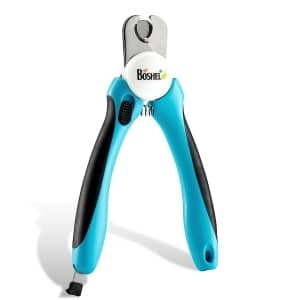 The Boshel nail clipper is recommended by professionals and dog groomers around the world. Thanks to the ergonomic design, it will provide a powerful and easy cut in just a matter of seconds if your dog will stand still. The product is large enough to be used on a medium and large dog and cat breeds and will provide a clean cut every single time. The blades are made of top-quality 3.5 mm thick stainless steel and won’t have to be sharpened again anytime soon. Thanks to the powerful blades, one cut is all you need to give your beloved pet a clean and clear manicure. The user-friendly design is intended for all dog owners and professionals and, thanks to the safety top, you won’t get over cut the nails. The Wagglies clippers will provide an easy, calm, and quick trimming. The item combines veterinary-grade materials with unbeatable safety features and user-friendly design to become the safest route to a good dog pedicure in just a matter of seconds. The product is easy to use and can help you turn the entire experience into a pleasant one both for you and your pooch. This clipper features an angled head and an ergonomic rubber handle to provide the most comfortable grip. The blades are made of sharp and rustless stainless steel of top quality, meaning they will cut perfectly every single time. The sensor guard attached will prevent you from cutting nails too short and injuring or scaring your pet. Moreover, the safety locks will help you easily store the product to occupy as little space as possible. These items were built to last, and this is why even the most inexperienced person could operate them safely. These clippers can be used on almost all dog sizes, apart from the very large breeds. The blades are made of qualitative stainless steel to withstand years of use without having to sharpen them again or change them. 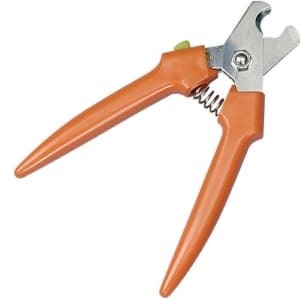 The body of the product features a comfortable red plastic handle for enhanced grip, as well as a spring-loaded cutting mechanism for clearer and cleaner cuts. The built-in guard will help you to avoid over cutting your dog’s nails or trimming them too short. All in all, we are talking about a great and very affordable item that every dog owner should purchase with confidence. In fact, most of the customers who already bought the item claimed it is easy to use and will make the entire pedicure process more bearable for your pooch. 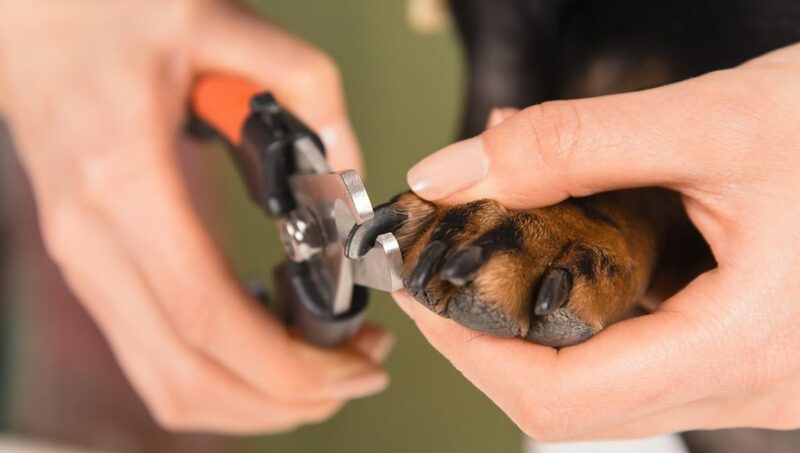 We know that dogs don’t look forward to pedicures, but with this easy-to-use trimmer, the experience will be at least bearable, if not even pleasant. 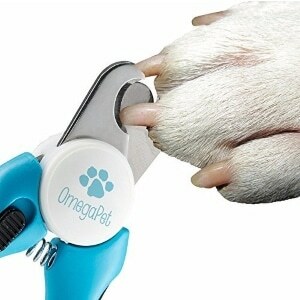 This product comes in different sizes, and you can also choose a complete set of tools to trim and cut your dog’s nails. The large size works best with large dog breeds, so if you own a smaller dog breed, we would suggest opting for an according to size. The handles are made of comfortable and soft rubber for a great grip and maximum stability. The scissor-style design will allow easy precision cutting and trim in one shot, avoiding long and painful pedicure sessions for your pooch. The product is of great quality and represents one of the items commonly used by veterinarians and groomers worldwide. Moreover, the double lock pivot screw allows you to cut even the smallest trails of edges and nails without hurting the dog. In other words, this item is safe to use both by professionals and amateurs, and its affordable price should definitely make you consider it next time you’re looking for a good nail clipper. This item is specifically designed to meet the needs of large dog breeds, so we suggest to use it accordingly. 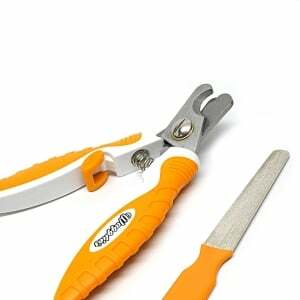 The comfortable grips and the spring-loaded mechanism allow easy and safe cutting anytime. This lightweight clipper is easy to use by anyone thanks to the injection-molded handles that will reduce fatigue and provide a steady press. The blades are also of great quality, being made of heavy-duty stainless steel and offering a clean and clear cut after each use. However, unlike other products, this one doesn’t come with a blade guard, so pay close attention when you cut your dog’s nails to avoid hurting or cutting too deep. 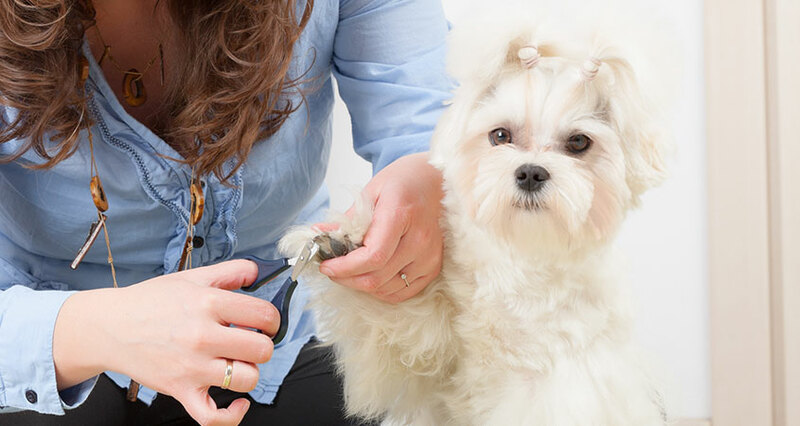 We must remind you that clipping nails are not amongst your dog’s favorite activities, so to make it as safe as possible, you must pay close attention to the clippers you use, as well as your cutting technique. Luckily, this 7-inch long clipper from Millers will cover your back. This item comes in four different color schemes and three different sizes to match the needs of most dogs. The regular nail clipper should be used on small-sized and medium-sized dog breeds, and cats. The company is the one that invented the guillotine style nail trimmer almost 100 years ago and is known for producing most of its items in the United States ever since. The item comes with a patented blade replacement technology that allows you to replace the blade of the trimmer when it’s no longer as sharp as you want it. Thus, you can keep the same nail clipper for years, a routine that your dog will very much appreciate. The item is recommended by veterinarians and groomers across the globe thanks to its durability, comfort, and precision. You can easily use the clipper on your dog similar to the one you would use to cut your own nails. The job is easily done, and your dog might even learn to appreciate the grooming process after all. Similar to all other items developed and marketed by Resco, this nail clipper features exceptional quality and will last you a lifetime from now on. You can purchase the product in the large or regular size, and you can also opt for the entire trimming and grooming kit if you want to take more care of your dog’s claws and paws. This trimmer features the same patented blade replacement technology that allows you to change the blades once they are not as sharp as before. This will only cost you a fraction of the price of the whole product that eventually limits the waste and protects the environment. The nail clipper is recommended by veterinarians and dog groomers from across the globe thanks to its deluxe grips and the premium powder coating on top. The product measures approximately 8.2 inches or 20 cm and is easy to use even by the most inexperienced dog owners. If you’re looking for a more stylish nail clipper to match the personality of your female dog, this cuteNfuzzy item could be a great choice. It comes in two different colors – pink and baby blue, and the large size is suitable for most adult dogs and large dog breeds. The product is equipped with high-quality stainless steel blades that are polished and nickel-plated to provide enhanced sharpness and durability. Thanks to this unique combination of materials, your trimmer will last for many years and thousands of cuts. The movable safety shield attached to the blades will prevent you from over cutting the nails of your dog and causing discomfort. 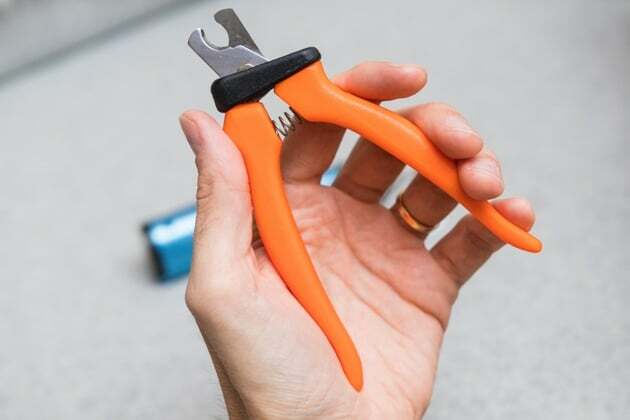 Moreover, the spring device that is found between the handles will allow you to cut and trim to perfection your dog’s nails at the same time. The nail file at the end of the soft handle will finish and polish your dog’s manicure for perfectly cut paws. Ordering this product will also bring you a free nail file to perfect your dog’s manicure and prevent rough edges from altering or scratching you and your precious objects around the house. The trimmer itself is made of high-quality 3.5 mm stainless steel blades that are perfectly sharpened to last you a long time from now on. The thick handles provide increased ergonomics while reducing fatigue during prolonged use. Besides, the handles will also help you comfortably wrap your fingers around the product for a tight and perfect grip every time. The safety stop prevents you from over cutting and helps you deliver a perfect, salon-like pedicure to your dog every time. So why not turn this unpleasant experience of grooming into a really relaxing quality time spent with your best furry friend? The nail clippers will provide a precise cut every time, while the nail file will perfect the manicure and keep it like this for more time. The item is perfect for cutting your dog’s nails whenever you need to. It is made of heavy-duty stainless steel blades of superior quality that won’t rust or blunt even after multiple uses. The stainless steel blades are sharpened to provide an optimum cutting effect with just one move. This way, the entire grooming process won’t take longer than a couple of minutes, so you can have more time to safely play with your pooch without having to worry about scratches and marks on your furniture. What we liked the most about this product is the ingenious anti-slip handle. It is made of superior quality rubber and can be safely used in all weather conditions, even during the rainy season. This means you can cut your dog’s nails outside too. The vast majority of the customers who purchased this item were pleased with the quality it offered, as well as the easiness of use. The item is sold in two different colors – blue and pink, to perfectly match the personality of your four-legged friend. The blades on this item are made of top quality stainless steel and are extremely sharp, so they will last you a long time from now on. The handle is made of durable and anti-slip rubber, wide enough for a good grip and hand support that will ease and fasten your moves. The safety lock found at the end of the handle helps you to easily and efficiently lock the clipper whenever you are not using it for safe storage. The item is also equipped with a sensor that doesn’t allow you to overcut your dog’s nails, for a better overall experience. This nail clipper is safe and easy to use, with 2.5 mm thick blades and a total length of 135mm, specifically intended for medium and large dog breeds. Finding the best nail clippers for dogs is not an easy task, especially since there are thousands of items you could take into account if you decide to shop online. However, we reckon that the best dog nail clipper should feature a set characteristics that are mainly shown and discussed above. 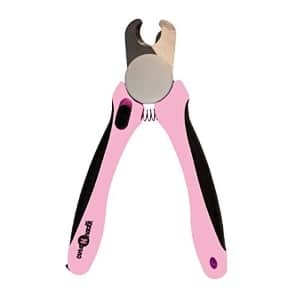 The first thing you should consider when looking for good dog nail clippers is going through some dog nail clippers reviews to see what other customers have to say about a certain product. The reviews can contain useful information not only regarding the product but also on how to properly use it and for which types of dog breeds it is intended. Moving on, we consider that size is extremely important in determining the best nail trimmers available for sale. It should be proper for your dog’s age and size to ensure a smooth and easy cut without too much trouble. Picking an unsuitable nail clipper size could even hurt your dog or take you much more time to complete the operation. Thus, we suggest you to carefully examine the clipper before buying it and compare its size with the size of your dog’s paws. The best large dog nail clippers should be around 15-20 cm long while for small dogs it is best to opt for mini clippers of a few cm long. If you decide to cut your dog’s nails on your own, we first advise you to find the right type of clipper suitable for your pooch. There are four main types of clippers you can use – scissors, pliers, guillotine-style, and dog nail grinders. Each come with their own perks and downsides, depending on the brand and the price you are willing to pay for them. 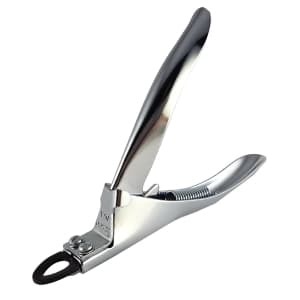 For instance, scissor-like nail clippers are one of the most affordable options and are ideal for small breed dogs. The best guillotine dog nail clippers are mainly intended for large dog breeds and are also the most common options available in stores. The guillotine style was introduced almost 100 years ago by the American company Resco and remained a hit ever since. Pliers and guillotine style clippers go around the same price range, so it is up to you to choose the best option for your pooch. As for the nail grinders, these are usually more expensive but are also more precise and suitable if you decide to go for a full pedicure for your dog. Grinders are perfect for trimming the nails of your dog in-between pedicures and cuts, and the style is safer to use than others. It is also important to know that nail grinders don’t actually cut the nails but mainly file them down. As a result, they can be used to trim and shorten your dog’s nails and is usually more bearable by animals. If you cannot handle all these options on your own, we suggest you search for some online reviews of dog nail clippers and get inspiration from other dog owners with similar dog breeds. In the end, the style is not as important as the action itself, so your dog needs to fully trust you for this process to go smoothly and as fast as possible. We also advise you to opt for the best professional grade clippers for dogs if you want your items to benefit from top-quality blades. The blades on these items are usually made of thick and qualitative stainless steel that won’t rust or go blunt after only a couple of uses. The sharpness of the blades, as well as their thickness, is extremely important if you want to ensure a clean and clear cut every time with just one move. This way, the entire grooming process will only last a couple of minutes, and your dog might even learn to appreciate it in time. After all, how do you think your friend will step into its new quality dog boots without a perfect pedicure? Whenever searching for new dog grooming clippers always have in mind the minimum safety features. Thus, a dog nail clipper with a quick sensor can really make the difference between a happy and traumatizing experience for your furry friend. Usually, these safety sensors don’t allow you to over cut the nails and hurt your dog. Whenever you’re not using the product, the safety features ensure that the blades maintain sealed and covered in order to be safely stored. Last but not least, pay close attention to the handles as well. 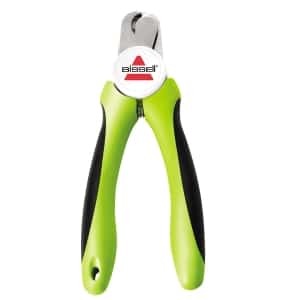 The best big dog nail clippers should feature resistant and reliable handles, preferably made of non-slip rubber. This will ensure a safe grip and easy use each time. It is important to keep your dog still during the cutting process to avoid hurting or overcutting by mistake. Searching for dog leashes could prove a suitable option if you know your dog is terrified of the process or if the entire procedure happens at the vet shop. Can dog nail clippers be used on cats? There is usually no difference in the nail clippers used for house pets like dogs, cats or larger-sized rodents, apart from the size. Thus, a regular nail clipper intended for small or medium-sized dogs will work perfectly also if you want to cut or trim your cat’s nails. It is best to compare the size of the clippers with the size of your cat’s paws and see if they remotely match. Can dog nail clippers be sharpened? Some of the products available on the market offer this possibility, while others offer the possibility of replacing the blades once they go blunt. However, since qualitative nail clippers are designed to last you many years, we don’t see why you shouldn’t decide to just purchase a new pair once the old one stops functioning. These are affordable items and changing them once in a while is also sanitary. How much do dog nail clippers cost? We have covered this subject previously in our guide, so we will only answer here briefly. There are four main categories of dog clippers, each designed for certain needs, and each coming with their own prices. 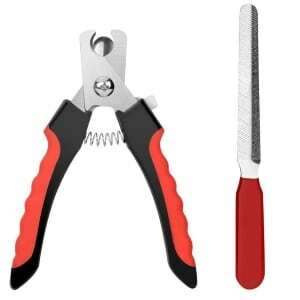 The cheapest nail clippers are the scissor-style and can cost between 5 and 15 dollars, while guillotine-style clippers are the most popular and range between 10 and 30 dollars, depending on their size. What size dog nail clippers are right? Choosing the right size is the most important aspect if you want to ensure a clean, clear, and safe cut. Most of the clippers come in different sizes specifically designed to meet the needs of all dog breeds. Usually, the smallest version is intended to use on teacup dog breeds, puppies, and small breeds, while the larger ones are mainly designed to cut the nails of large dog breeds, over 50-60 pounds. Just make sure to read the instructions carefully and identify the type of breed the clippers are intended for. How to clean and maintain dog nail clippers? If the item comes with detachable blades, we suggest you replace them often, especially if you work in grooming salons, to avoid bacteria and dust interfering with the nails. The blades are usually made of qualitative stainless steel that shouldn’t rust in time, so cleaning the clippers should be easy. You can clean the clippers by using regular water and soap mixtures or by using specific cleaning solutions or sanitary alcohol (also rubbing alcohol or surgical spirit). 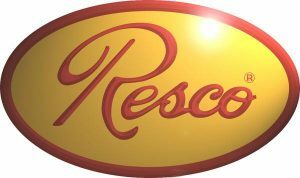 Resco is a reputed company that took birth nearly 100 years ago in the United States and has maintained its qualitative products over the years. 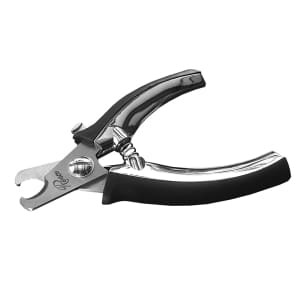 It was Resco that first invented the guillotine nail clippers that are now known around the globe. 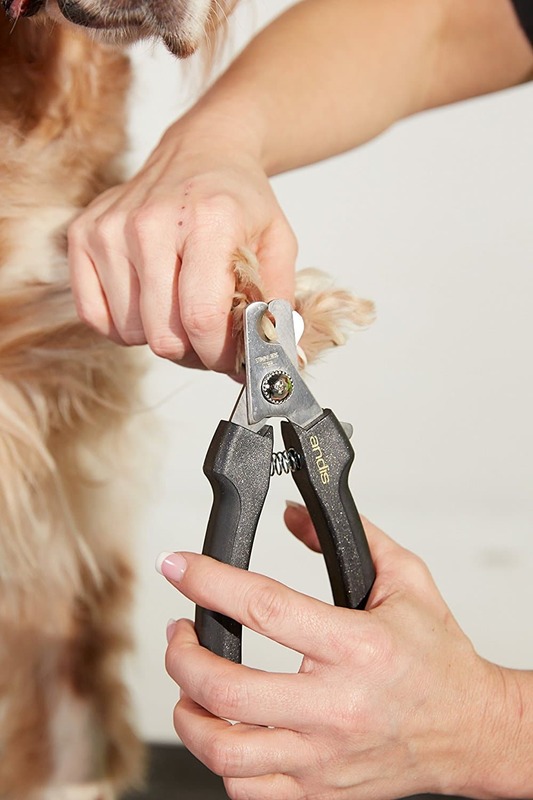 The Resco Pet Products engages to offer affordable and easy to use nail clippers for your pet, in the hope that the entire grooming process will become more bearable. The items feature fun and innovative design, and they are easy to use even by the inexperienced dog owners. Andis is another reputed brand with a legacy of over 90 years in creating and delivering high-quality products for cutting, grooming, and styling. Andis has a special line designed for the specific needs of animals, including horses and cows that need to be properly trimmed and cut on a regular basis. Their dog products are also great as they come in stylish designs and exquisite quality. 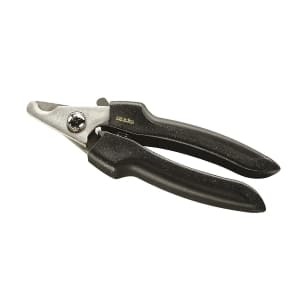 The nail clippers for dogs are made of high-quality thick stainless steel to promote an even cut in just one move. The handles are also anti-grip to provide the best holding so that you can finish cutting and filing the nails of your pup in just a few minutes. Millers Forge takes pride in manufacturing and delivering pet products ever since 1945, expanding their lines as the needs of our pets evolved during the years. The most popular products of the brand include oral hygiene solutions, grooming products, and odor and stain removing products. The grooming products are all made with extreme care to meet the needs of every individual and breed. 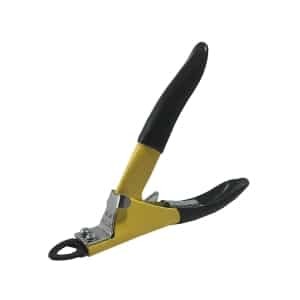 The nail clippers are often accompanied by qualitative nail files and other trimming accessories to perfect the canine pedicure. The company has understood that clean and short nails will prevent hurting other people and damage the goods inside the house, so Millers Forge is dedicated to creating high-quality items that will strengthen the bond between you and your dog. 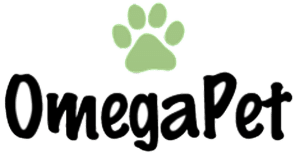 Last but not least, Omega Pet is a young company founded in the United States in 2012 but engages to deliver high-quality grooming and healthcare products for your dogs. From essential oils to shampoos, lotions, and nail trimmers, you will find a great variety of natural, qualitative, and affordable products at Omega Pet. Their nail trimmers come in funky designs and feature additional accessories to deliver a high-end pedicure for your dog in the comfort of your own home. The products are designed to last and be comfortable to use by humans in order to finish this tormenting procedure as fast as possible. When it comes to grooming your pet, cutting the nails is perhaps one of the most traumatizing experiences of all. From rabbits and rodents to dogs and cats, none of these pets is willing to stay still for their owners to provide a clean and nice pedicure. So how do you transform a painful task into a decent, if not a positive experience? 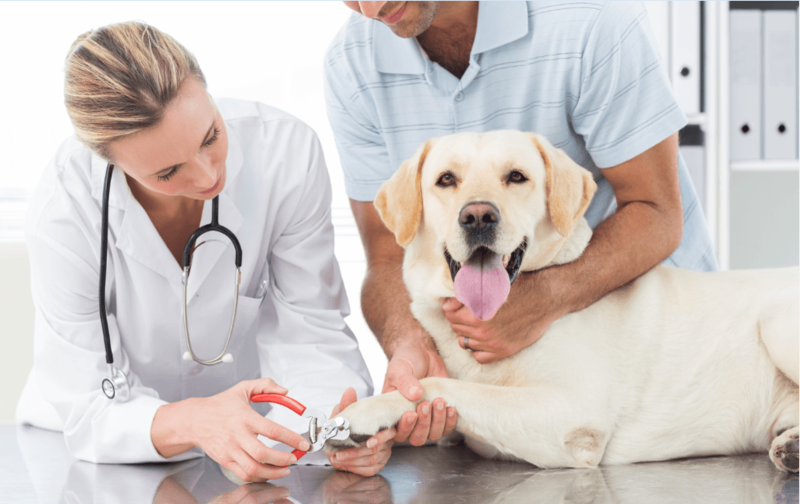 First of all, you need to take into account that cutting your dog’s nails is mandatory if you don’t want to risk breakage, deformity, nail infections or scratched furniture and wood around your house. If you plan on doing this operation on your own, in the comfort of your own home and without your dog’s veterinarian, you first need to ensure a safe and welcoming environment. A good thing is to previously prepare your dog for what’s following, meaning have it take a bath for the nails to soak in as much as possible. If your dog has any particular rituals he or she enjoys during or after bathing, now it is time you ceased in. Start by grooming your dog’s hair and making it feel as comfortable and relaxed as possible, then go for the nails as fast as you can. It is important your dog feels safe with you handling sharp objects around it. If you can’t seem to get your dog to stand still, try by handling his or her favorite chewing toy to release stress and anxiety. You can also wear your dog’s leash to let them know this is a serious job. And, finally, try to finish the job as fast as possible and handle your dog a well-deserved treat after the nail filing procedure. As we previously mentioned, it is extremely important to cut your dog’s nails at least once a month. Just like humans and other animals, dogs also require their nails for a wide array of outdoor activities, but having grown nails is never a pleasure. There are several reasons why you should carefully look for your dog’s pedicure, and here are some of the most important. Just like humans, long nails on dogs tend to create a sense of discomfort and can even become dangerous. First of all, having your dog walking around daily with long nails could be painful since the pet will put pressure on its paws for every step he or she takes. Thus, during long walks and physical training, long nails will prove extremely uncomfortable and painful. They will also cause discomfort when running and may even determine your dog to slow down or stop running. Another reason why you should regularly cut your dog’s nails is to prevent breakage. Long nails often get dull and will easily break, especially if your pet is active and prefers long walks and runs in the park. Also, long nails are definitely more prone to split and cause additional pain and discomfort. Usually, the nails get naturally blunt by walking on grown, in the garden or on soft and moist surfaces, but since most of our soils are now covered with concrete, it is almost impossible for your pup to blunt its nails naturally. Last but certainly not least, long nails can favor the appearance of fungi, bacteria, and infections that can later spread all over the body and cause more serious health problems. Thus, carefully wash your dog’s paws and clean them each time you get inside the house, and make sure to regularly cut, trim, and file the nails to prevent the risk of infections that might come in contact with the blood vessels found at the base of the nail. There are several ways to diminish the traumatizing experience of cutting your dog’s nails if you start young and have lots of patience during the process. The first thing you need to do is accommodate your dog with the shape and sound of the nail clippers. Thus, before using it for the first time, make sure your dog knows this is a safe and unharmful tool. You should first present the clipper to your dog close and have him, or she take a look at the object. Keep it around the dog closes for a while. The next day you should carefully open the clippers in the presence of your dog and accommodate him or her with the sound. Again, let them know there is nothing to be afraid of, and even make a quick demonstration on one of your nails. Once your dog gets used to the look and the sound of the clippers, it is time to start the procedure. We suggest to only use scissors-like clippers as they are more delicate and easy to use. Besides, they won’t crush the toe just like the guillotine clippers, which obviously causes pain and discomfort to your dog. Pliers also work great as most of these items come with a complete set of instructions on how to cut the quick. Also, make sure you have chosen the correct size for your own dog breed. Most of the dog breeds will require a small or medium-sized clipper as they provide better control for your hands. Only use a large nail clipper if you own a large and extra-large dog breed. Once you have introduced the clippers to your dog, it is high time you started bribing your pet with sweet treats and lots of love. Start by taking each paw at a time and holding it firmly yet gently. Your dog can benefit from a nice pedicure once in a while, for the simple reason that he or she cannot do it, and, as a responsible dog parent, it is up to you to decide how to go about such a thing. 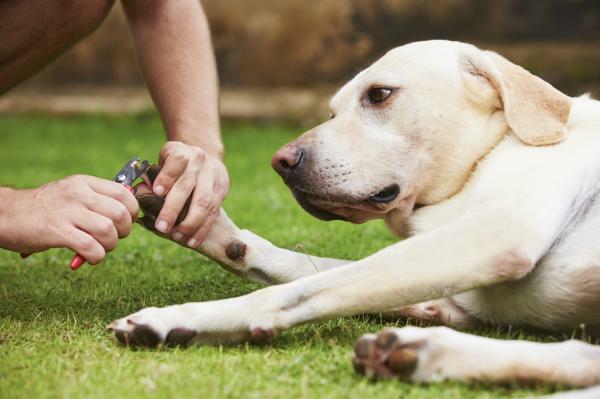 It is easy to clip your dog’s nails, but you need to know a few things in advance. 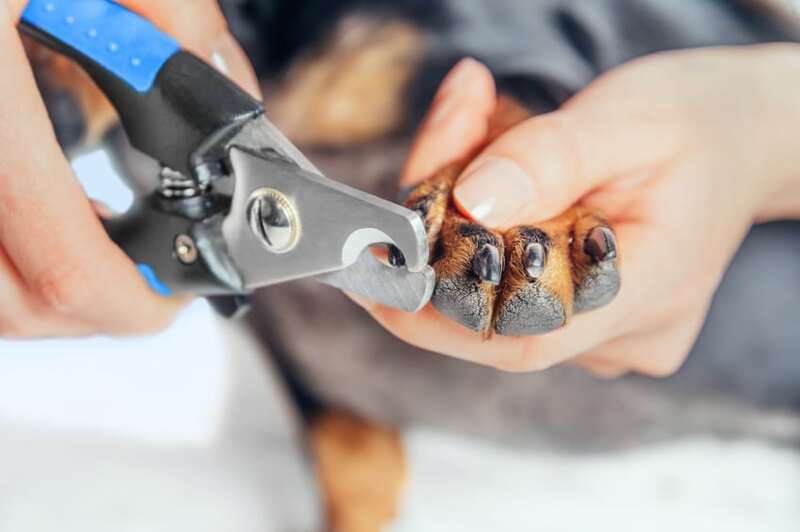 First things first, you should get some nail clippers for dogs, if you want to perform this task without any problems or making your dog feel uncomfortable. You will discover that there are a few styles available. The easiest model is a guillotine style that can be used for small breeds with guaranteed success. In case you have a larger dog, and the style mentioned above fails to perform as intended, you can pick a pliers-style. This one allows you to deal with larger, tougher nails with minimum effort on your part. There is also the scissors-style available, too. Some clotting powder and anything that you can use to sterilize the dog’s nails after performing the clipping is needed. Sometimes, you may cut your dog’s nails too short, and that can cause bleeding. To take action fast, grab some septic powder and sterilize the small cut. In case you don’t have anything of the sort handy, you can also use baking soda. It will help close the small wound, and you will have nothing to worry about. You can use baking flour or cornstarch with the same success. Don’t forget to have some treats closeby, too. Once you finish clipping the dog’s nails, offer him or her a small tasty morsel. That will compensate for the nuisance and will make future nail clipping sessions much easier to go through. You may feel a bit challenged by using such a tool, and you may notice that your dog is just as nervous. The first thing you should do is to test the nail clippers to see if they function as they are supposed to. When you start to clip the dog’s nails, grab each toe between your fingers and grip the nail clippers firmly. A steady hand will limit the risk of mishaps, and your dog will feel that you know what you are doing. It is also a great idea to get your dog used to the idea. That means that you can rehearse by holding the clippers close to the dog’s nails while offering him or her tasty treats. After a while, you can use the clippers to make a sound. It helps to provide some praises along the way, too. This will prepare your dog for the final act, which can happen sooner than you think. As long as you don’t forget to reward your dog for being calm during the whole thing, both of you will be just fine.